If your pet suffers from dry eyes, it is incredibly important to restore the necessary moisture to avoid progression, which can lead to blindness. Assessing the root cause is also top priority, as many disorders require additional medication for initial treatment. While dry eyes are often caused by aging, there are many other possible causes that require further examination. Breed predispositions, immune disorders, dietary deficiencies and disease are all possible causes. OptixCare Eye Lubricant + Hyaluron is a moisturizing ophthalmic lubricant, designed for veterinary use, in the form of a unique sterile carbomer gel. Optixcare eye drops for dogs offers soothing relief and is approved for use as horse eye drops and cat eye drops as well. Instill 1-2 drops in one or both eyes as often as needed or as directed by your veterinarian. Many pets require drops as often as every two hours, in the early stages of treatment of KSC. If multiple eye medications are prescribed, consult with your veterinarian to assess the correct order of application. It is important to use extra care when instilling the drop to avoid touching the eye with the tip, in turn, contaminating the tube and its contents. Store at room temperature. Recap after each use, and discard the open tube after 30 days. We recommend speaking with your vet if the problem persists or worsens. Help keep your pet’s eyes performing to their fullest potential with Medi-Vet! What is 5 in 1 vaccine for dogs? Many dog owners consider their furry friend to be a member of their family and would do anything to protect their loved one. While federal law requires every pet to be vaccinated against rabies, there are additional vaccination options that can fully protect your pet from various deadly diseases to be considered as well. Some pet owners choose to administer only the minimum federal and state required vaccinations, and others choose to administer any and all vacinations available. We’re here to aide you in assessing which are important for your pet and why. The Canine-Spectra's 5 in 1 Vaccination provides protection from Distemper, Hepatitis (Adenovirus type 2), Parainfluenza and Parvovirus. Distemper has a 50% survival rate, coming in second only to rabies in global mortality rates. This is incredibly unfortunate, considering distemper is preventable with vaccination. Progressive in nature, this disease eventually causes severe neurological, respitory and dermatologic illness. Hepatitis effects, primarily, the liver and is 100% preventable with the appropriate vaccinations. This vaccine provides protection for both type 1 and type 2 Adenovirus infections, which are incredibly contagious and the cause of canine hepatitis. Dogs of any age can become infected with canine adenovirus, via contact with infected urine, feces, saliva or mucous. Parvovirus is a severe and life-threatening infection that causes bloody stool and vomiting to such an extreme degree that it has been known to cause shock and even death. This illness is immensley contagious and can affect dogs of all ages, however puppies are even more succeptible. Additionally, while the illness itself is very unpleasant, it also weakens the immune system and destroys the lining of the intestines, setting the patient up for additional infections. Treatment may be very costly, but around 80% of puppies recover completely. Parainfluenza virus is extremely contagious from dog to dog, and one of the most common causes of “kennel cough”. Kennel cough is characterized by a dry cough which can last for several months, even with treatment, and is very unpleasant for your dog - potentially leading to pneumonia and death. No pet owner wants to see their loved one suffer through any of these illnesses, and while administering the vaccine can be momentarily unpleasant, it substantially outweighs the alternative possibilities. Treatment is extremely expensive, whereas the vaccine is not. If you ever plan on boarding your dog, having them accompany you to work, attending doggy playdates or dropping them off at a daycare, there is always the risk of becoming infected. The 5 in 1 vaccine provides you with some of the most important vaccinations that are needed for your pet to live a long, healthy life. An ounce of prevention is worth a pound of cure. 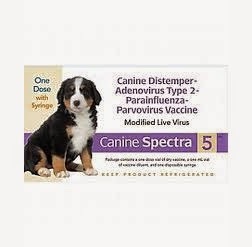 Order Canine-Spectra's 5 in 1 Vaccination from Medi-Vet today!